If you need someone to change out your light bulbs you are in the right place. We serve both residential and commercial customers and take on light bulb replacement projects of all sizes. Whether you need light bulbs replaced in tall ceilings or hard to reach places, of if you would like to replace your light bulbs with energy efficient LED bulbs, we can take care of it for you. 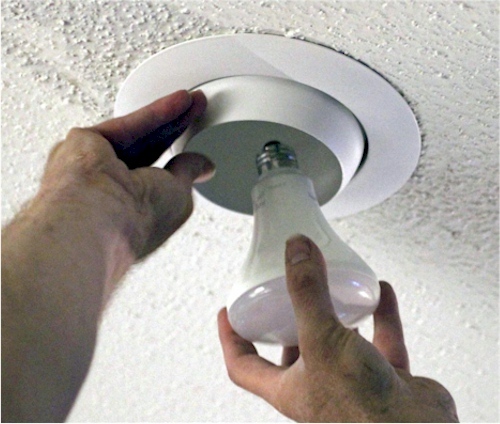 We can replace bulbs inside of complicated fixtures, in stairwells, and everywhere else. We replace standard light bulbs as well as chandelier light bulbs, fluorescent lights, spotlights, recessed lights, and everything else. Our dedicated handymen will show up on schedule and change out all the old light bulbs with brand new ones. No job is too large or too small. It doesn't matter if you want us to replace one bulb or one hundred. We want you to be fully satisfied with our light bulb changing services, and your complete satisfaction is our top priority. All you need to do is fill out our short contact form, briefly describe your light bulb replacement needs, and we will get back to you right away with a free custom quote. Light Bulb Changing - Select your State.